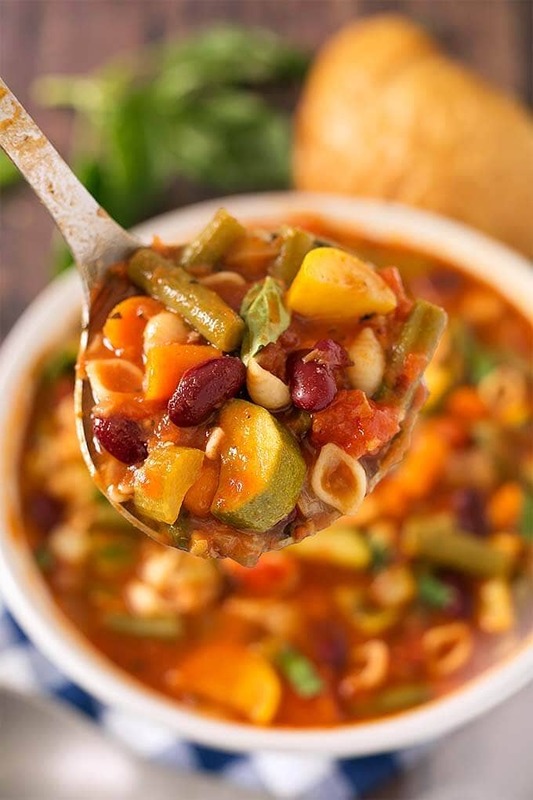 Instant Pot Minestrone Soup is a classic Italian soup loaded with vegetables, beans, pasta, and lots of flavor! 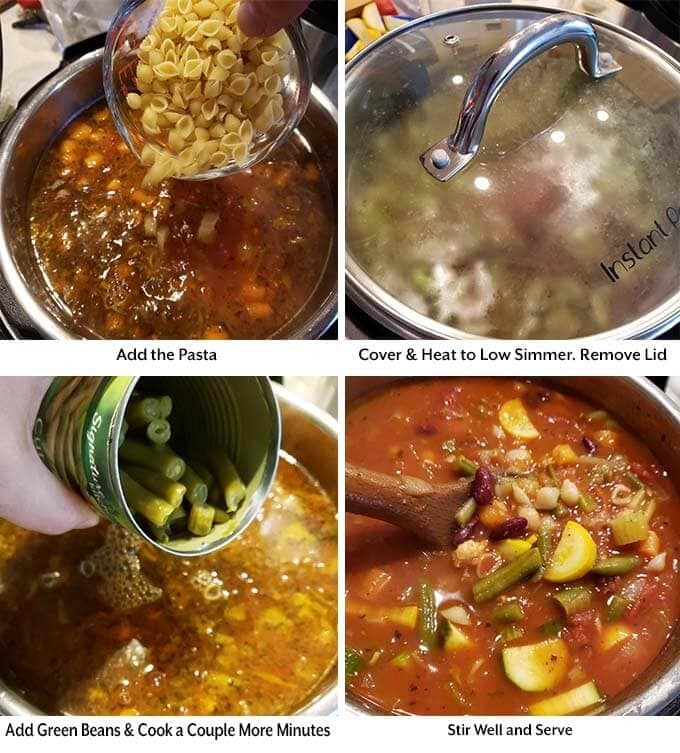 When you make this pressure cooker minestrone soup, clean out that vegetable drawer in the fridge! 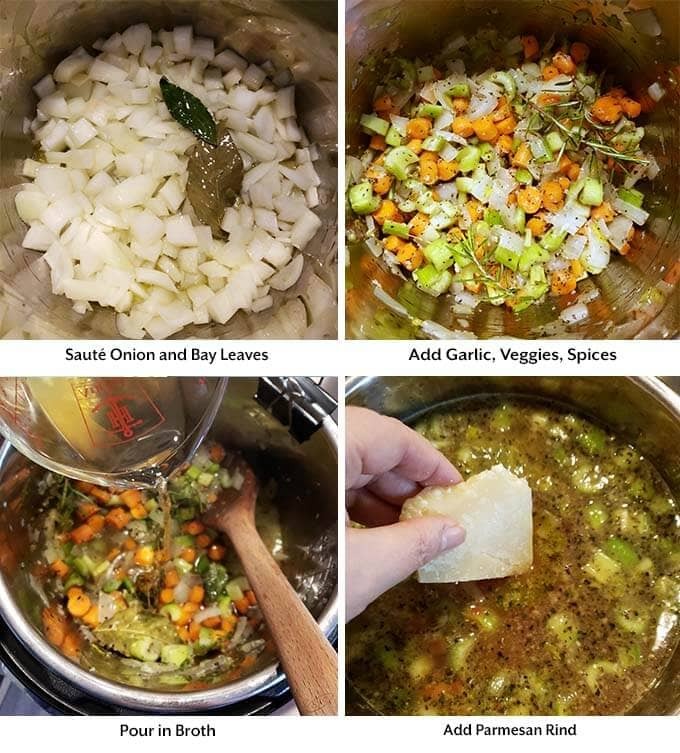 This is a versatile and tasty Instant Pot soup recipe! Soup season is upon us, and today I’m bringing you a classic. Minestrone! 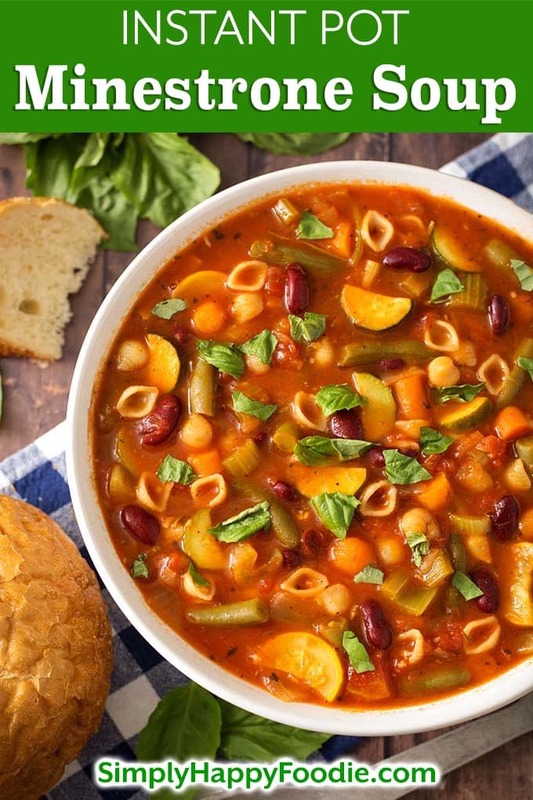 This Italian soup usually has broth, mirepoix, tomatoes, beans, pasta or rice. I use what I have in the pantry and fridge, as do most people who make this soup. 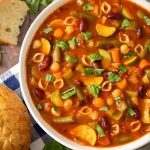 I have never seen two Minestrone soup recipes that are identical! 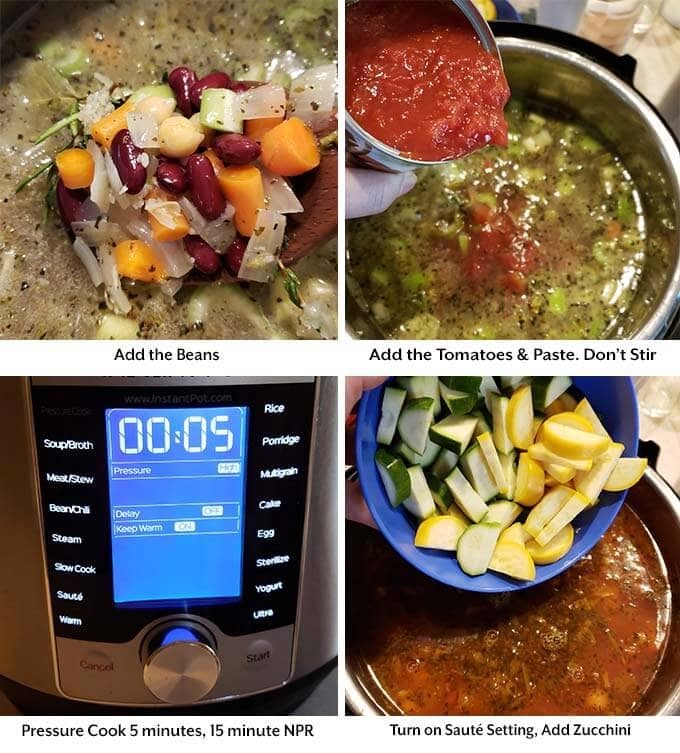 Instant Pot Minestrone Soup is a vegetarian soup, however, I choose to use chicken broth in mine as I prefer it. Feel free to use your favorite broth. Also, there is no harm in adding some meat to this soup. Little meatballs, ground sausage, or beef tips would all be really delicious. There is a lot of prep work involved in making Minestrone soup, due to it being a vegetable heavy soup. The upside to all of that work is that once it reaches pressure it has a fast cook time. Still, this is not the fastest soup recipe you can make in your Instant Pot®. It will go faster if you cut the recipe in half, as there isn’t as much volume in the pot to get up to pressure. That takes 10-15 minutes or so for a full recipe. 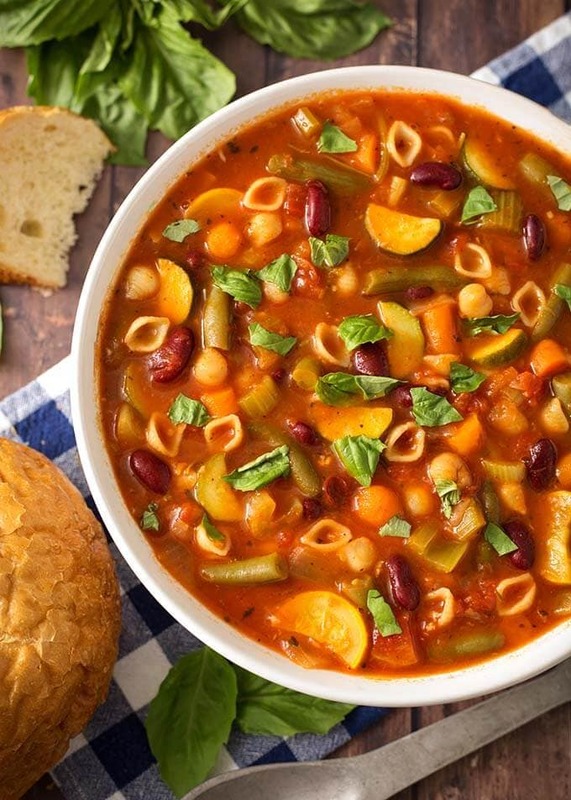 This Instant Pot Minestrone recipe makes a lot! We can get up to 12 servings, depending on how full we fill our bowls. The leftovers are wonderful, since all of the flavors had time to meld together. This soup freezes really well, too. I like to freeze it in quart size freezer bags for easier reheating. 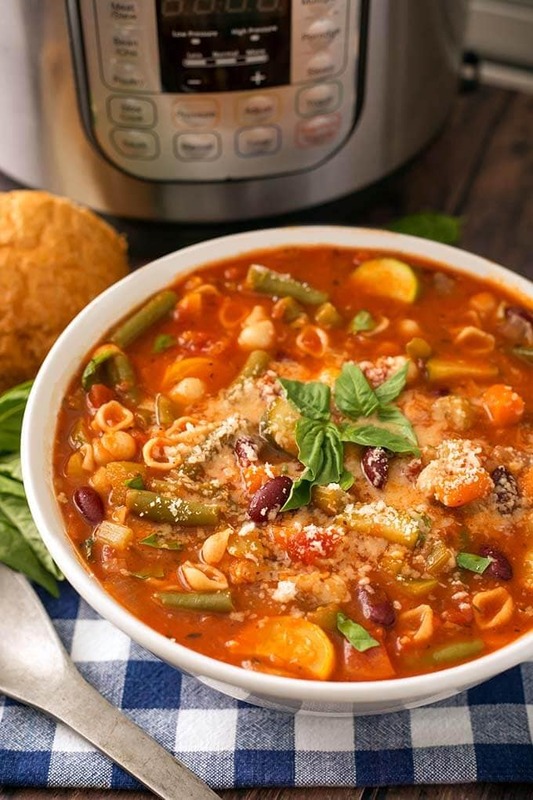 Instant Pot Minestrone Soup is a classic Italian soup loaded with vegetables, beans, pasta, and lots of flavor! 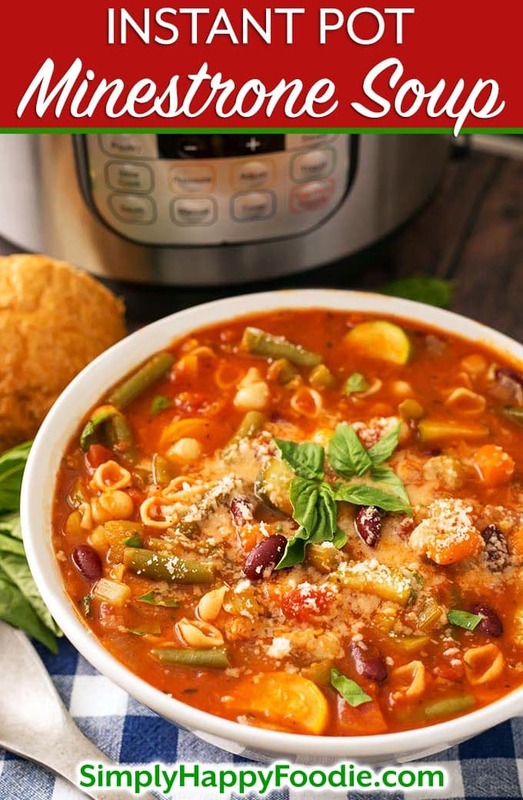 When you make this pressure cooker minestrone soup, clean out that vegetable drawer in the fridge! This is a versatile and tasty soup recipe! Before you begin the cooking process, have all of your ingredients ready to go. Chop your veggies, open the cans, rinse the beans, measure the spices, etc. This will make the process go smoother since there is a lot of prep. Turn on the pot's Sauté setting. When the pot is hot, add the olive oil. Then add in the onion and the bay leaves and cook, stirring occasionally, until onions start to turn translucent. Add the garlic and cook for about 20 seconds, stirring constantly, or until it is fragrant. Add the carrots, celery, oregano, basil, rosemary, salt, and pepper. Stir. Pour in the chicken broth, parmesan rind, if using, kidney beans, and garbanzo beans. Stir. Pour in diced tomatoes and crushed tomatoes. Do not stir. Spoon the tomato paste on top. Gently press to submerge it, but do not stir (tomatoes burn easily, so this method helps prevent that). Press the Pressure Cook/Manual button or dial, then the +/- button or dial to select 5 minutes. High Pressure. The pot will take about 10-15 minutes to come to pressure as this is a very full pot. When the cook cycle has finished. Let the pot sit undisturbed for 15 minutes (15 minute Natural Release). Then do a controlled Quick Release of the pressure. *A controlled quick release means you release the steam in short bursts, then longer bursts, until you can be sure none of the sauce spews out of the vent with the steam from the intense pressure. Then fully open the vent and let it go. When the pin in the lid drops down, open the lid and carefully stir the soup. Turn the Sauté setting back on and add in the zucchini and pasta. Put a glass lid on, or a silicone lid to keep the heat in so it comes to a simmer faster. Take off the lid when it starts to simmer (there is a chance that it won't simmer, but the pasta will still cook as it is very hot). The zucchini and pasta will cook in 5 to 10 minutes, depending on the type of pasta, and how thinly you cut the zucchini. Add the drained can of green beans and let them heat through. Garnish with some fresh basil leaves, more parmesan, and serve hot with nice crusty bread.